Rachel Von | The Journal Gazette Jet fuel sits atop the St. Marys River near Monmouth Road in Decatur on Saturday after a pipeline leak. Crews began cleaning up the leak after it was discovered Friday. Rachel Von | The Journal Gazette The St. Mary’s River along Monmouth Rd. in Decatur, IN on Saturday September 8, 2018. A jet fuel leak has resulted in multiple roads closing in Decatur, Adams County emergency dispatchers said. Some 7,700 gallons discharged into the St. Marys River on Friday leading to road closures in the area, including Monmouth Road near the wastewater treatment plant. 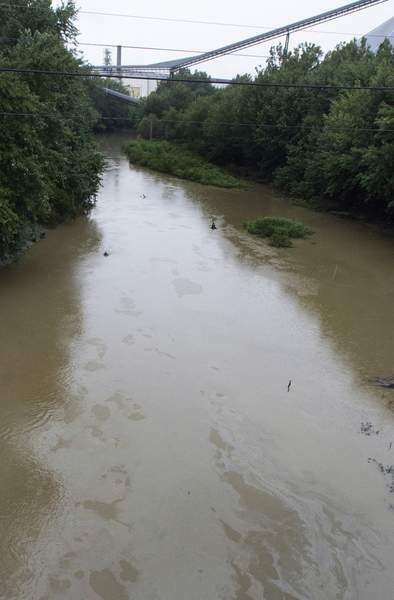 Officials are cleaning up more than 8,000 gallons of turbine fuel that leaked into the St. Marys River in Decatur after a pipeline failed to contain the pollutant, officials said Saturday. Cleanup started immediately after the leak was discovered at 5:17 p.m. Friday, according to Buckeye Pipe Line Co. L.P., which is responsible for the leak. Booms were set up in the St. Marys River to contain the turbine fuel, also known as jet fuel. Several roads were also closed, including Monmouth Road near the city's wastewater treatment plant, officials said. The U.S. Environmental Protection Agency said it is monitoring air in neighborhoods and businesses near the river. The EPA said it is also monitoring water quality at several locations downstream. No fires or injuries were reported, Houston-based Buckeye Pipe Line said, and the pipeline will remain shut down until it is repaired and considered safe to reopen. “One of their workers discovered a pressure drop, went immediately to check on it and immediately shut it down,” said Bernie Beier, Allen County Homeland Security director. Beier was monitoring cleanup activities by several contractors hired by Buckeye at the Allen County-Adams County line. Beier said that while the booms contained the pollutant so it could not spread, contractors were using hoses to vacuum the fuel off the top of the water. “So the goal is to get as much of the product or the fuel off the top of the river before the rains get heavier, the waters rise and the currents get faster,” Beier said. “When the water becomes more turbulent, anything off the top tends to get sucked down with logs, sticks and debris. “And they're really making great progress, they're getting a lot of fuel off the water,” Beier added. 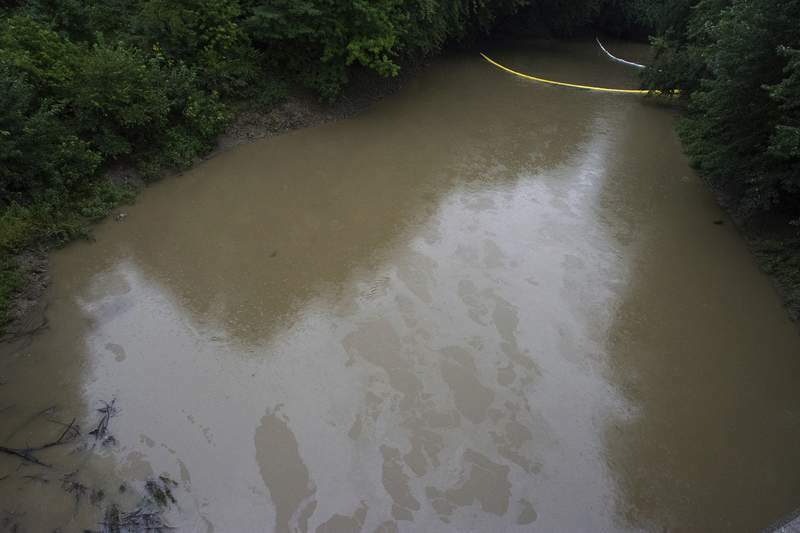 Decatur Mayor Kenneth L. Meyer said crews worked through the night to clean up the spill. He said there was an odor in the air, “but it's not toxic.” The cleanup could take weeks, Meyer said. As crews were busy cleaning up pollution on the St. Marys River near Decatur, volunteers from the Save Maumee Grassroots Organization had their annual fall cleanup on the St. Marys near the Wells Street Bridge in downtown Fort Wayne. Hearing about the fuel spill, Abigail Frost-King, president of the Save Maumee Grassroots Organization, thought of a West African proverb.